My favorite place for kielbasy in the area is called Jubilat Provisions located on 608 5th Avenue @ 17th St in Brooklyn. If you keep your eyes peeled in addition to the selection of smoked meats, cold cuts, mustards, and pickles you’ll occasionally spot some interesting snack items. My interest in trying new foods has had some hits and misses. For example, I bought a few Jelly Donuts from there. Because the donuts were surrounded by meats they reeked of kielbasy however. One positive discovery of late are the puffed corn snacks. 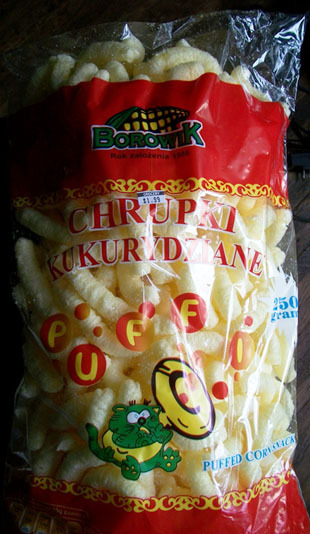 The Borowik Chrupki Kukurydziane Puffis are a Polish product but have a label in English as well. They come in a comically large bag (it’s actually 250 grams/8.81 ounces). The packet was only $2 so it was a great value. These are basically just cheese puffs without the cheese. There is just one ingredient, corn and no seasoning at all. The pure corn flavor though is enough. These are super addictive. They’re great dipped in hummus. Again, no gluten or dairy listed in the ingredients here. You also have to love a product which features a green Garfield look-a-like playing a tuba. Plus they’re called Puffi which is very endearing. I buy these whenever I have the chance.